I packed up camp and left about 8:00. I had tried to make it to Karakorum yesterday, but after getting slightly lost and having left UB late I still had a few km's to go.. Actually I didn't know how far I had to go! But I had a bigger problem than being lost, I hardly had any money with me! Stupidly I had left UB with only a small amount of cash. I knew that I would have a lot of trouble finding somewhere to get money, I was pretty sure there were no ATM's anywhere in Mongolia except in UB. There had been an ATM 100 meters from the Oasis Guest House that I had stayed at all week and I still forgot to get enough money, I'll blame the nervous excitement of the whole thing! It frustrated the hell out of me, but I had made the decision to keep going and see what happened. I made it to Karakorum about lunch time. 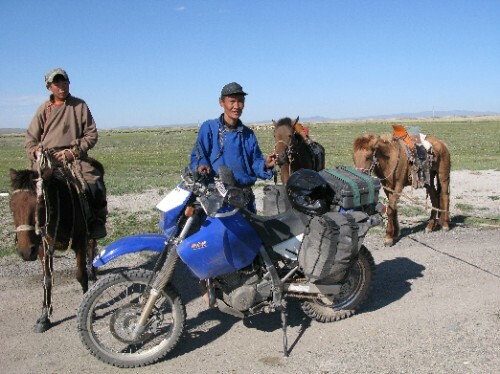 Karakorum is the site of the old capital of Mongolia and former home to the most famous of Mongol's - Genghis Khaan. What I was most interested in was finding some bank or something similar to obtain some funds for enough fuel and food to get me to the Russian border. I guessed that this was a bit of a tourist attraction and therefore may have some sort of cash getting facilities. Although I relise when I rode into town that it's not exactly Disneyland, actually it's not even Luna Park. The only hope I had was a bank in the middle of town, I managed to talk myself into going in where I was confronted by more than a dozen people pushing up against the counter. It must of been payday. I showed one of the tellers my Visa card and wrote down how much I wanted, I guessed 300,000 Tugrug ($A300.00) would be too much, but I didn't want to risk running out of money to buy fuel like I almost had in Russia. The teller processed the transaction on what looked like a very normal EFTPOS machine and handed me the receipt, but no money. He could see me about to get angry and pointed very politely to a man further up the very long counter. I stood and waited for this fella to finish with his customer and then handed the receipt I had been given at him thinking "this won't work". He smiled, opened the cash draw and counted out 300,000 in front of me and what now must be 20 other people. This was the prelude to a mugging if I had ever seen one. I quickly grabbed the cash and accidently thanked him in Russian. As I was putting the money in my most difficult to get to pocket I looked at the Mongolian standing next to me to see another bank teller counting out what looked like a million Tugrug to him. He must of seen the shock on my face and looked up and just smiled. I noticed on the way out everyone seemed to have fists full of cash, it really was payday! I breifly contemplated where all this money would come from in what seemed to be a fairly poor country, but decided I was too hungry to think about Mongolian economics and sped off up the road to find some food. After something to eat and stocking up on the usual chocolate bars (KitKats actually, hadn't seen one of them for a while! ), I consulted my partially useless map and the completely useless GPS and took off in the direction of west. It didn't take long before I came to my first Mongolian water crossing, it didn't look too deep but I pulled up to have a closer look just in case. As I was staring into the water and planning my route across the 20 meters of clear Mongolian stream a couple of locals rode up on their horses to see what I was doing (thats them in the photo). They said some stuff I didn't understand and I showed them my map and asked if I was going in the right direction. They seemed to think so, so I waved goodbye and (very) carefully crossed the stream and tore off up and over the next hill. That was the first of 12 water crossings, see the blog from the 17th for a run down on the last one. I arrived in Arvayeer around 9pm after riding through the dark for the last hour or so and almost running into the back of another bike that had no lights. After a good 12 hours on the bike and a beer with a Kiwi named Doug I was asleep in no time.